Showing 7 articles from April 29, 2014. 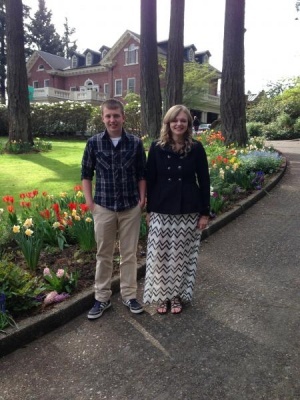 Photo by Gracie Manlow Zane Johnson and Emily Seaman attended the 10th Annual Governor’s Volunteer Service Awards ceremony at the Executive Governor’s Mansion in Olympia. SOUTH BEND – The 10th Annual Governor’s Volunteer Service Awards were presented to honorees on April 21, 2014 in a ceremony at the Executive Governor’s Mansion. Among those nominated were two South Bend High School seniors, Zane Johnson and Emily Seaman. The Winlock School Board has decided to maintain a combined boys soccer program with Toledo, while students and parents say they could not be more excited with the decision. In a 2-3 vote during a special meeting held April 30, the district declined to withdraw from the program, allowing athletes to compete together for another two years until both districts are asked to renew again in 2016. The Willapa Valley Grange will host its annual plant and garden sale this Saturday from 10 am to 4 pm. This event is free and open to the public. North Beach conquered its competition at the highly competitive Comet Invite at the 11-team Naselle last Tuesday (April 22). Raymond finished a strong third; South Bend was fourth, and Willapa Valley placed eighth. Raymond's Rayce Newman (200 meters) and South Bend's Dennis Johnson (triple jump) were the only local winners. Raymond's boys easily won a four-team track meet at Ocosta, while the Lady Seagulls finished two points behind the winning host team to finish second. four schools hooked up at the Wildcats' Westport facility last Thursday. Taholah was third in the boys' meet and Mary M. Knight was third in the girls' meet. Willapa Valley edged rival South Bend in girls' track at Naselle in the 11-team Comette Invite last Tuesday (April 22). Raymond finished fourth. Willapa Valley defeated Adna in boys golf 189 to 207, but lost to Wahkiakum's round of 177 lasts Thursday in a three-team match at Skyline Golf Course in Cathlamet. Zach Calvert of Wahkiakum shot an excellent round of 38 to finish first and teammate Austin Good was second with a round of 41.